… and the best answers. This is Smoke. He let me take pictures of his iridescent feathers for a long time while I figured out my selective color camera settings. Smoke on the other hand can see things in the Ultra Violet spectrum. And he’s turning into a bit of ham for the camera. Pigeons- cooler than you think. You can try and argue with me on this one but be warned, I have 3,456 more pictures of pigeons and I will use them! Months ago Ivy came home bubbling over with excitement about the upcoming science fair. She deliberated long on what her experiment would entail and settled on growing pea plants. Perfect, I said, we have a greenhouse! Ivy planted three pots of peas, and planned to water them with orange juice, blue water and regular water respectively. Liquids were carefully measured, growth and changes were noted and things were going swimmingly. Months ago Clara fell in love with pigeons and started hand raising babies. Despite a number of setbacks the number of baby pigeons in our house rose while the temperature outside plummeted. No problem, I said, we have a greenhouse! Clara moved her four pigeons to the greenhouse where they happily flew around while she did crafts on the floor spending time with them. All five of them made a tremendous mess of everything and they were all exceedingly happy if a bit of a disaster. One day, Janurary 23rd to be exact, Ivy came to me in tears. “The pigeons at my peas!” Sure enough. All those healthy looking peas that seemed to love their blue food coloring enhanced water, as well as the control pot of peas were eaten down to nothing. The moldy orange juice dirt was untouched and the pigeons looked not even a tiny bit remorseful. It’s okay, I told Ivy. I’m a biologist (as a mother, stretching the truth is a requirement of the job, alright?). This is just how science goes. Write down what happened, call it an unexpected variable, document the pigeon problem and it’ll all be fine. Last week the pigeons, due to more set backs, (but the story of how Frosty was re-named Toasty is for another day), were still flying around the greenhouse when Ivy proudly took her trusty tri-fold board complete with pictures of pea plants and pigeons off to the science fair. This week she came home beaming- turns out that with proper documentation even pigeons can’t ruin a good science fair project. That’s a fifth place ribbon behind her and she’s even still friends with the pigeons! 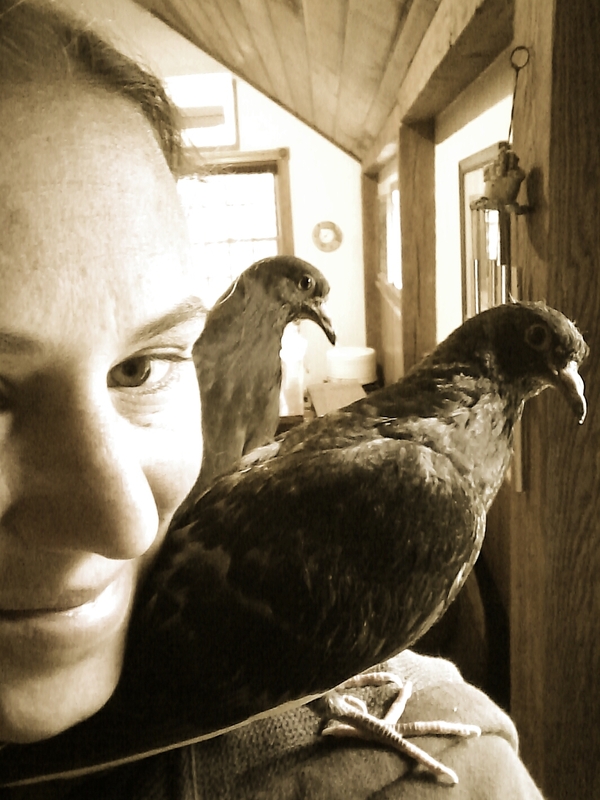 …you may accidently run errands with pigeon poop on your shoulder.